This is not an isolated episode. Across eastern Europe NATO forces are steadily closing in on Russia’s borders. The article below outlines how NATO warplanes are now deploying on Russia’s southern flank near the Black Sea. Further north, near the Baltic, NATO troops and tanks are deploying to forward bases close to Russia’s western borders in Lithuania and Poland. Ostensibly this is being done “to counter increasingly provocative actions by a growing Russian military force in the region”. Or so the following report claims and that pretty echoes the official NATO line. Moscow would probably disagree however. In their eyes the West is taking “provocative actions” with NATO’s troops, tanks and planes deploying right on Russia’s western borders. If the roles were reversed and Russian forces were deploying close to Western Europe or America’s borders there would be some justification for acussing Russia of “provovative actions”. But Russian forces are not deploying on our borders. Instead it’s the West that is being “increasingly provocative” while the corporate media justifies its action with these unfounded claims. Ed. 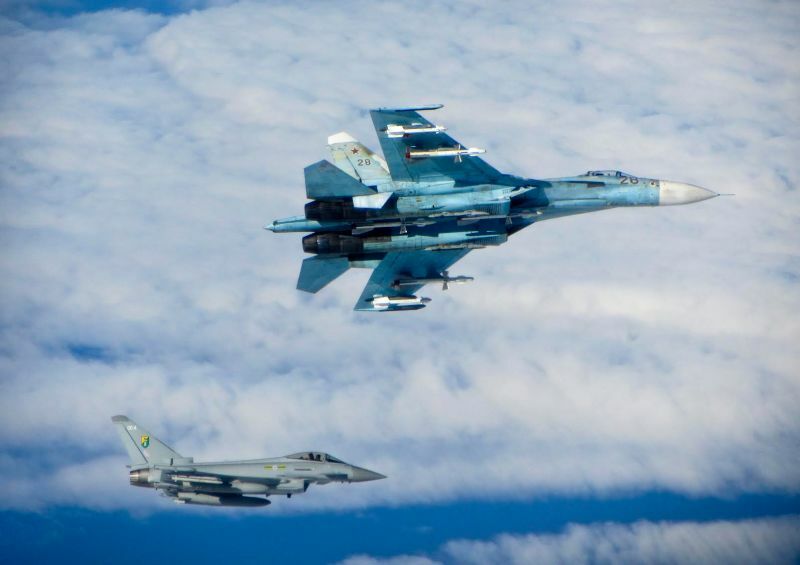 In a move that will surely make the volatile Black Sea region even more interesting, NATO will begin basing fighter jets in Romania in May, the United Kingdom announced this week. While it may not seem like much, it means NATO will further expand its reach into Russia’s southern flank, basing jets minutes from the Black Sea and sending one of the clearest messages yet to the increasingly aggressive country. The UK will be the first member of NATO to provide aircraft and personnel for NATO’s Southern Air Policing (SAP) mission. Yesterday, British Defense Secretary Sir Michael Fallon announced the start date for the mission and that four RAF Typhoons from 3 (Fighter) Squadron based at RAF Coningsby would be the first unit to begin flying operations from the former Warsaw Pact nation. The RAF Typhoons, and future NATO aircraft, will fly from Mihail Kogalniceanu Air Base in southeastern Romania, 16 miles from the port city of Constanța, and only a few minutes flying time from the Black Sea and the numerous Russian aircraft which that fly daily from bases in Crimea. This impressive array of Russian military aircraft will most certainly be intercepted once the quick reaction aircraft (QRA) are in place to undertake the intercept and identification mission. The RAF will provide Typhoons until September when the Royal Canadian Air Force takes over, bringing four CF-18 Hornets to Romania for their four-month stint. The SPA will closely mirror the Baltic Air Policing (BAP) mission, which has been running since 1 April 2004 when four Belgian F-16AM fighters began flying from Šiauliai International Airport, Lithuania. Established to protect Estonia, Lithuania, and Latvia, then three of the newest members of NATO, BAP will begin its 14th year of providing a peacetime collective defense mission, safeguarding the integrity of the NATO Alliance Member’s Airspace. Prior to 2014’s Russian annexation of Crimea, the number of yearly intercepts in the Baltic was relatively low, with 2013 having 43 such instances. After Crimea, the numbers skyrocketed to 140 in 2014 and 160 in 2015. In 2016, that number dropped some but still reached 110. Speaking to Newsweek, Maj. Gen. Thierry Dupont, commander of one of NATO’s Combined Air Operations Center, where decisions are made regarding the launching of alert NATO aircraft, suggested the decline could possibly be related to Russia’s increased involvement in Syria. The Black Sea region has been a hotbed of military activity since Russia invaded and annexed Crimea in early 2014 and no other NATO country is closer to Crimea than Romania. The former Warsaw Pact nation, is now one of NATO’s most important members simply because of geography (it shares a border with Ukraine as well) and a willingness to matter. As a result, Romania has been lobbying for a more active NATO presence in the Black Sea region for several years now, requesting the leadership in Brussels deploy ground troops within its borders and to establish a permanent NATO fleet in the Black Sea, all to counter increasingly provocative actions by a growing Russian military force in the region. Troops will eventually arrive in Romania but placing a permanent NATO fleet in the Black Sea is more problematic due to the constraints of the Montreux Convention. The 1936 agreement demands that warships of non-Black Sea states be under 15,000 tons and cannot remain within the Black Sea for more than 21 consecutive days. Any NATO naval force would have to come from Bulgaria, Romania or Turkey, which are the only NATO Black Sea states. Tensions between NATO, specifically the U.S. Navy, and Russia in the Black Sea was on display during the last year with two high profile incidents involving Russian aircraft, and a U.S. Navy aircraft and destroyer. In early September, a P-8A Poseidon maritime patrol aircraft had departed NAS Sigonella, Italy on a mission that would take it over the Black Sea as it patrolled the airspace south of Sevastopal, the large Russian naval facility in Crimea, where Russian has based four Project 636 (Improved Kilo) class diesel-electric submarines, which would of a high priority for the P-8A crew. While in international airspace the P-8A was intercepted by a Russian Su-27 Flanker and during the nearly 19-minute intercept, the Su-27 in a dangerous and unprofessional maneuver moved to within 10 feet of the P-8A. And just last month, sailing in international waters in the Black Sea, the USS Porter, a guided-missile destroyer was buzzed by four different Russian aircraft, including three Su-24 Fencers attack warplanes and a single IL-38 May anti-submarine warfare aircraft. One of the Su-24s passed within 200 yards of the destroyer during one of their multiple passes. To complicate things further, almost a year ago in May 2016, Romania “officially” was placed on Russia’s targeting list (along with Poland) by Russian President Vladimir Putin, when a U.S. built and manned ballistic missile defense site became operational in that country. The Aegis Ashore Missile Defense System is part of a plan begun under the Obama Administration in 2009 to provide some form of missile defense protection for Europe, mainly from the threat of Iranian ballistic missiles. However, the Russians do not see the Aegis Ashore facility as simply as NATO does, in that it exists solely to protect from potential Iranian aggression. The facility and its anti-ballistic missiles are seen by Russia as nothing but a threat to Russia, and the nation’s future ability to conduct offensive operations in the region should the need arise. Recognizing a difficult situation, Romania has pledged to spend 2 percent of GDP (about $4 billion, which is one-third the price of the newest U.S. Navy aircraft carrier USS Gerald R. Ford) on defense and that is directly related to the increased Russian activity in the region. The Romanian Air Force, or Forţele Aeriene Române, has been a leading beneficiary of the increased defense spending of recent years. As one of the smallest air forces in NATO, and before the arrival of the first six of 12 purchased ex-Portuguese F-16AM MLU Vipers last September, the only fighter in Romania’s inventory was the Cold War-era Mig-21 LanceR. Though heavily modified from their original Soviet construction by the Israeli company Elbit, these MiG-21s were in no way comparable to the fourth-generation fighters flown by other NATO members. The 12 F-16s Romania has purchased from Portugal include nine single-seaters and three two-seaters. Nine F-16s has so far been delivered and the final three examples should arrive by late this year. Already Romania has suggested that purchasing another 12 F-16s is on the horizon, and combined with the remaining serviceable MiG-21s, Romania’s air force will have made significant strides in a short period of time. Preserving the integrity of NATO airspace is a fundamental undertaking by the alliance, and only a collaborative effort will make it work. As witnessed over the Baltic, and other NATO countries which do not have the requisite air defense posture, NATO has ensured that those needing their airspace protected would indeed have it protected. However, Romania does have an air force, and while the MiG-21s they operated had very short legs and were not the optimal air defense fighter, they could manage to pull off an intercept of most Russian Black Sea-based aircraft operating without hostile intent. With the arrival of the F-16 into its stable, the Romanian Air Force will no doubt be able to undertake this mission as it needs to be executed. So why deploy NATO aircraft to a nation that has an adequate air defense posture? With the growing assertiveness of Russia, NATO has decided to push back. Four Typhoons or Hornets is by no means a large force, but it is significant in that NATO recognizes the need to counter Russian aggression and is willing to do so through the collaborative effort of an air policing mission, which is enough to send a message to Russia by positioning fighters within 30 minutes flying time of their bases in Crimea.